Celebrated as the most notable portrait and landscape painter of Georgian England, Thomas Gainsborough (1727-1788) was also a brilliant and experimental draftsman. In this lecture, Marco Simone Bolzoni, Moore Curatorial Fellow and curator of the exhibition Thomas Gainsborough: Experiments in Drawing, will investigate the unorthodox means and materials used by the artist in his quest to capture the beauty of the English countryside. The exhibition Thomas Gainsborough: Experiments in Drawing will be open for program attendees. $15; free for members and students with a valid ID. Tickets include free admission for the day of the program. 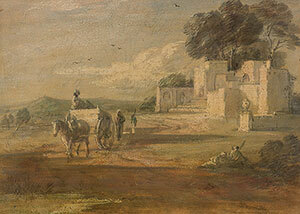 Thomas Gainsborough (1727–1788), Landscape with Horse and Cart, and Ruin, in 1770–75. Oil paint, lead white chalk, watercolor, over black chalk, varnished, purchased by Pierpont Morgan (1837–1913) in 1909. The Morgan Library & Museum. III, 55. Photography by Steven H. Crossot, 2014.